Top Tax Defenders is the sole owner of the information collected on toptaxdefenders.com. Top Tax Defenders collects information from our users at several different points on our website. If a user wishes to subscribe to our newsletter, we ask for contact information such as email address. Out of respect for our users privacy we provide a way to opt-out of these communications. From time-to-time our site requests information from users via surveys or contests. Participation in these surveys or contests is completely voluntary and the user therefore has a choice whether or not to disclose this information. The requested information typically includes contact information Users’ personally identifiable information is not shared with third parties unless we give prior notice and choice. Though we may use an intermediary to conduct these surveys or contests, they may not use users’ personally identifiable information for any secondary purposes. Monetary estimated amounts are based on previous results; individual results will vary depending upon your ability to provide Top Tax Defenders with timely and accurate information. Fees are not included in resolution/settlement outcomes. We cannot guarantee that your tax liability will be lowered by a specific amount or percentage, or that your tax liability will be paid off within a specified time period. Top Tax Defenders will offer possible solutions to a prospective client after all relevant information is obtained during the initial consultation. While solutions will be offered to client, there is no guarantee of results implied or otherwise. Testimonials appearing on this site are actually received via text, audio or video submission. They are individual experiences, reflecting real life experiences of those who have used our products and/or services in some way or another. However, they are individual results and results do vary. The testimonials and/or case studies are received from our customers and attorneys and CPAs. They are partially dependent upon each customer’s individual situation and cooperation. We do not claim that they are typical results that consumers will generally achieve. Each client's case predicated upon their own unique set of circumstances and fact set. If users have any questions or suggestions regarding our privacy or disclaimer policy, please contact us. 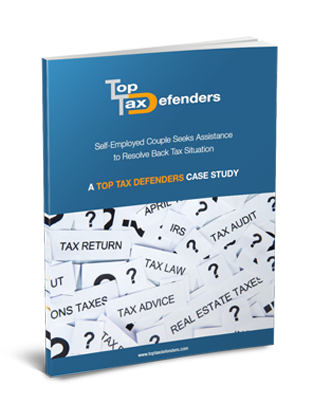 Learn how one couple worked with Top Tax Defenders to lower their owed back taxes.